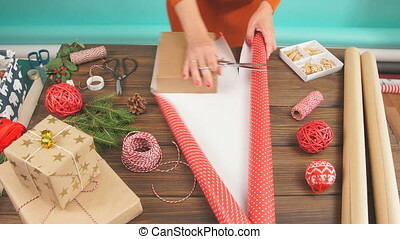 Woman in a red sweater wrapping gift box with equipment and decorating items on wood table, preparing for celebrating Christmas holidays - top view. 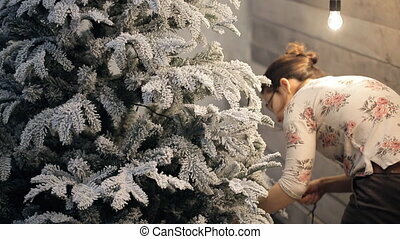 Woman decorates room for the New Year. 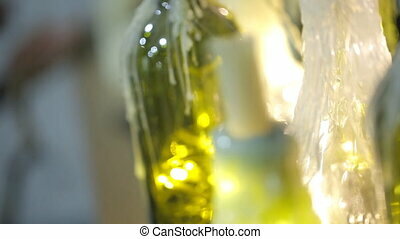 In the foreground you can see white candles inserted in a green glass bottle close up. 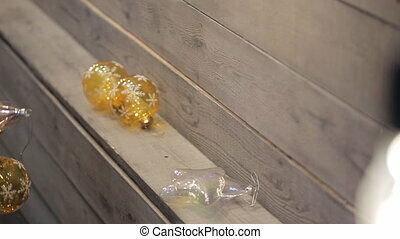 Near lie large thick white candles of various sizes and pine cones on light wooden shelf hanging on the right side of wall. 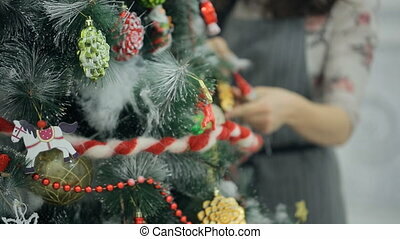 Cute female decorates branch to create wonderful holiday atmosphere and good mood for celebration. Her movements are deft and precise. She uses scissors that lay nearby. 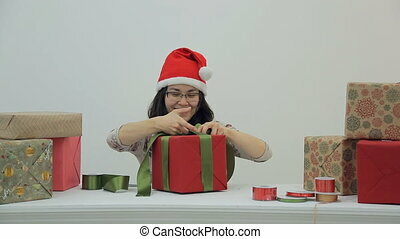 Woman makes bow gifts for Christmas, New Year. Female with red curly flowing hair in gules hat white fur around face and small ball at top, glasses in dark frame, in black sweater, with pendant with chain ties narrow green ribbon around scarlet wide one. Lady spreads her creation, examines it. She stands in front of snow table with box, covered by decoration with Christmas tree toys pattern, rolls of juniper, candy gold tape, wrapping paper rolls. Pretty woman ties red ribbon into beautiful bow. Adorable female is very serious and not smiling. It seems she is not happy with her work. She is concentrated and confident doing her job. Female in black glasses is clothed onyx blouse in white dots and warm two-colored knitted jacket. Wonderful pendant on silver chain is hanging on her neck. It gives to whole image elegance, beauty, sensuality and tenderness. 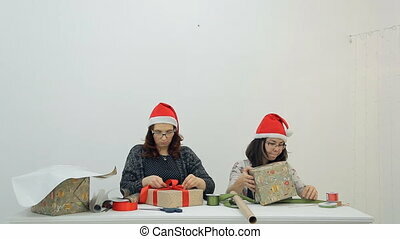 Two women decorate gifts with bows for Christmas, New Year. In front of us Asian with black flowing hair, in sweater with flower pattern, gray apron, with silver ring on right hand tries to tie bow of wide green ribbon, but cannot manage and becomes upset. 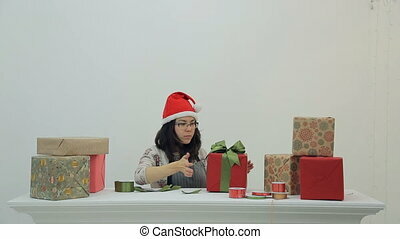 Female with red curly hair, in black sweater with glasses in dark frame works with scarlet tape and box, covered by wrapping paper with Christmas tree toys pattern. Ladies stand near window with snow transparent curtains. 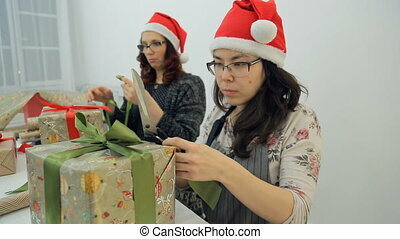 Two women decorate gifts with ribbons for Christmas, New Year. In front of us Asian with black flowing hair, in sweater with flower pattern, gray apron, with silver ring on right hand, Female with red curly hair, in black sweater. They both have scarlet caps with white fur, glasses in dark frame. Ladies work with green, candy strips, make bows. On snow table there are gold, candy, juniper narrow, wide tapes, wrapping paper, different equipment like scissors. Charming brunette ties red ribbon around gift. Beautiful woman in red New Ye cap trimmed with white fur, black square glasses, bright green t-shirt with image of flower and warm woolen onyx and white jacket is clearly dissatisfied with something. Elf of Santa Claus does not want to do work and pack Christmas boxes for children. Maybe she was tired or not able to do it. She nods agreeing then throws tapes refusing to tie it. Her lips are pursed and she is outraged. 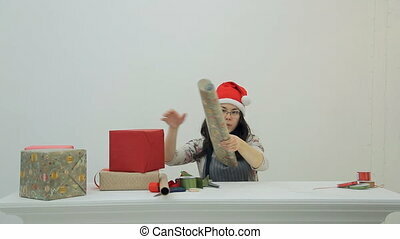 Woman in scarlet Christmas cap looks at spinning cone in her hand. Somebody raises his arm in black sweater, we see only silhouette of female. she holds Christmas tree pine cone on cord, and then turns it. First it twists in one direction, then in opposite. 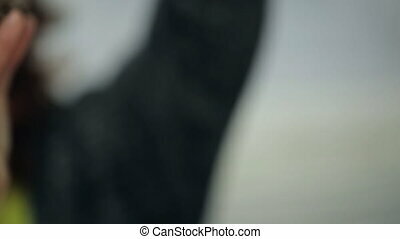 This time focus of camera is on whirligig, next it moves to pretty lady with red curly flowing hair in gules hat with white fur around face and in small ball at top, also she wear glasses in dark frame. 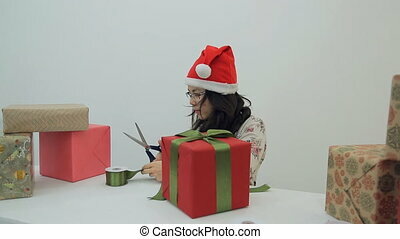 Asian cuts green ribbon to make bow for decoration box for Christmas, New Year. In front of us young lady with black flowing hair in red hat with white fur around face and in small ball at top, glasses in dark frame, in sweater with flower pattern. On her right hand there is silver ring. It is gift wrapping. On snow table there are many cases in paper of all kinds: scarlet, with different snowflakes, stripes, toys, that need to be packed. One of it is in final stage. 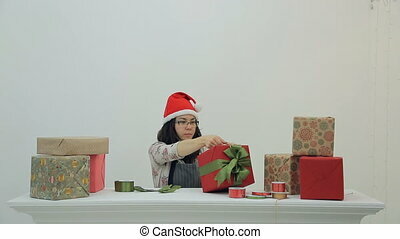 Asian prepares gifts for celebration of Christmas, New Year. In front of us young lady with black flowing hair in red hat with white fur around face and in small ball at top, glasses in dark frame, in sweater with flower pattern. On her right hand there is silver ring. 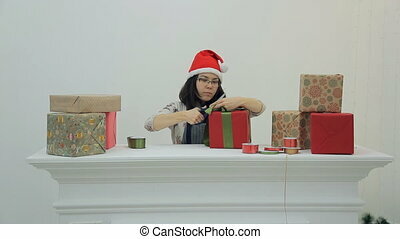 She turns green ribbon around scarlet box, then cuts tape. In front of her on snow table there are many cases: scarlet, with different snowflakes, stripes, Christmas tree toys and gold, candy, juniper strips. 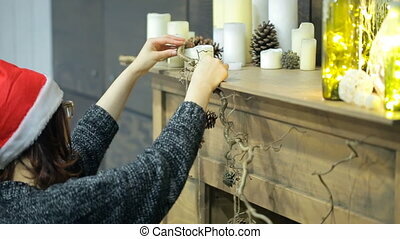 Woman decorates wooden fireplace to celebrate Christmas, New Year. Female with red curly flowing hair in gules hat with white fur around face and in small ball at top, glasses in dark frame, in black sweater examines place for pine cone. On chimney there are many different candles: short, tall, thick, thin. they are not lit yet. Near with them there are bottles of green glass, garlands. In front of fire is located dry twig. On this branch lady cables cords with decoration. Asian wraps gifts for Christmas, New Year, other holidays. In front of us young lady with black flowing hair in red hat with white fur, glasses in dark frame, in sweater with flower pattern, gray apron, with silver ring on right hand. 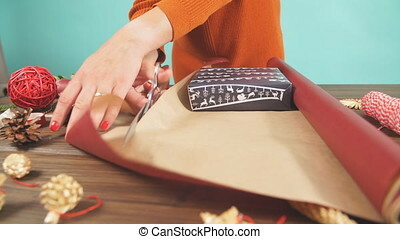 She removes scarlet box, takes wrapping paper, spreads it on snow table, brings case, examine length of packing material. There are different presents around: in stripes, Christmas tree toys, green, gold candy, juniper strips, scissors. 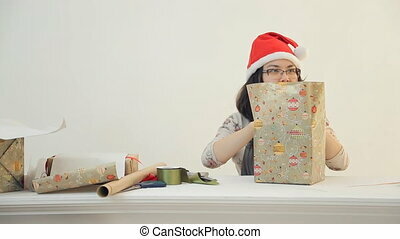 At the table, woman in the hood cuts off excess tape on a gift. 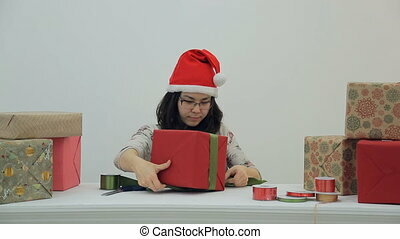 She sits in glasses and a red cap with a pair of scissors in his hand, which shortens the thread with a green bow. Near on the white desktop are colored boxes and coils with bandages. Model of Asian appearance with a straight face packs boxes for Christmas and New Year. On the headdress of white pompons. Helper Santa helps prepare for the holiday. 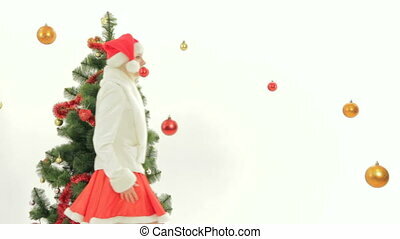 Woman is twirling in arms a red Christmas tree decoration in form of ball. 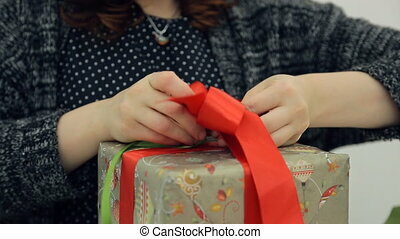 Close-up of female hands holding a toy in palms of hands on background of packaged gifts for holiday. 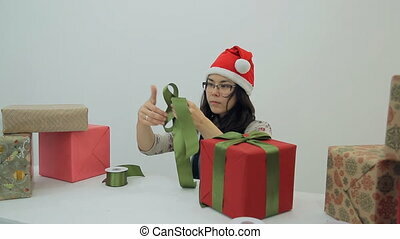 Charming woman is tying ribbon on holiday gift. Fun and wonderful brunette in red New Year cap trimmed with white fur, black square glasses and gray sweater with floral print smiles, laughs and makes faces during the whole process. Cute elf of Santa Claus continues to work intently and confidently. On white wooden table are still plenty of unpacked colored boxes that are waiting for its turn to become delightful and beautiful. 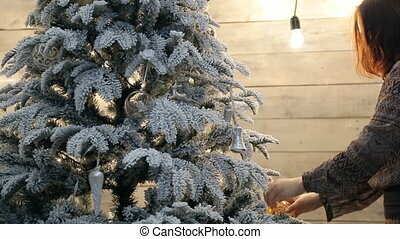 Woman in a gray dress is decorated artificial Christmas tree. Human being in the room strengthens ornaments on strings. On the green trees with white-coated hanging red beads, wooden horse and Russian Father Frost. On the branches are fixed green and red bumps, as well as yellow balls. Around stretched tinsel and colored ribbons. 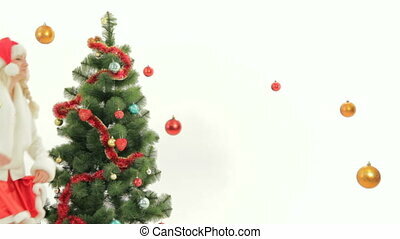 Required attributes for the celebration of Christmas and New Year prepared in December.